Ernesto was a nonevent here, but last night's landfall in "Norcalina" is bound to cause serious flooding. I don't remember the storm name, but I recall a few years ago when the region was devastated by floods from a tropical system. In my memory are pictures of thousands of dead hogs from hog farms that went completely under. Today's post is just a wish for things to go as smoothly as they can and a hope that the flooding is not as bad as the last time. Well, I'm glad that Ernesto didn't give you any grief, but it's too bad about your pond nonetheless. Thanks for the pretty picture :) The sky here is a very dark gray at the moment. You are thinking of Hurricane Floyd which followed on the heels of Hurricane Dennis - both torrential rain events for NC. Devastating floods for much of my area with those two. We are getting pretty soaked up here in northeastern NC right now. The drive into work this morning was a little touchy. Luckily I only had to drive through standing water one time - unfortunately, that was in a curve at an intersection (or crossroads as we call 'em around here). We are supposed to be through the worst of it by about noon today. I'll add my wishes to yours, FC. They have had flash flood warnings up where we are in SW Virginia. Fortunatly we haven't had that much rain. It got kinda windy last night, small branches and lots of leaves down but nothing serious. Up here on the mountain all the water runs down into the foothills but again, thank God, no major problems. The eastern part of the state got the worst of it. The bee pictures were awesome too! Oh, and I don't like yuccas. Far as I know, the bacon is safe. But it ain't so good, overall. Re the post below: Honey wash away too? From a negligent blogger these last few days: Too bad about the bees. Thanks for the pond sympathy. Ernesto left not a drop of water on Pure Florida. 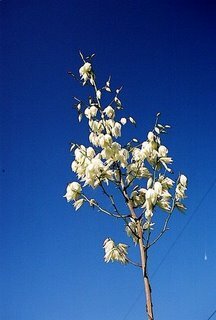 Why do you hate yucca? I'm glad you and yours are okay. I was thinking about ya'. That was a fall sky from last year. I guess so, to be honest I didn't reach in there. Well, frozen winters are enough to deal with. Really cool house pics at Debs site!